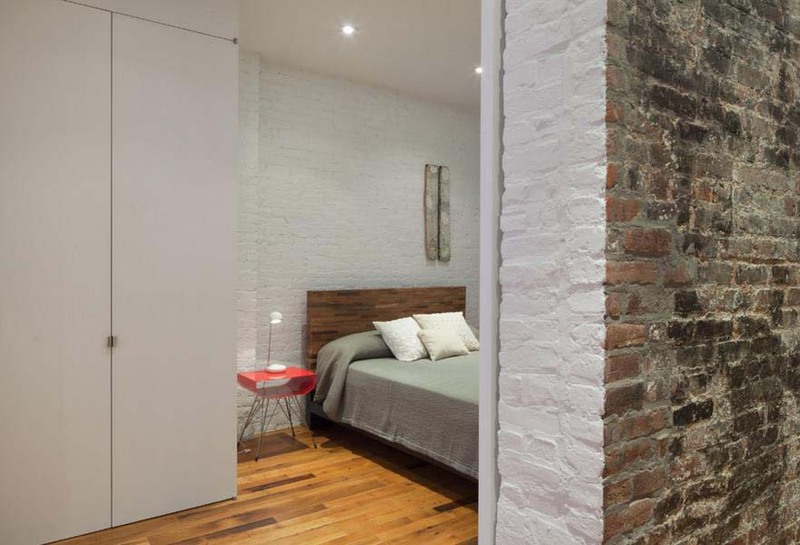 An exposed brick wall in a room doesn’t always mean industrial. Moreover if we talk about the specific white brick wall, the style and design it suits will be way more than just one kind. The range is wide as well as the effects it creates. If you want to know further, scroll this article all the way down. But before you do that, here are the lists of pros and cons regarding having an exposed brick wall. Bricks are popular and thus easy to find. Exposed bricks add some texture to an area. Bricks are porous and should avoid being splashed by any kind of liquid. It is quite challenging to hang artwork and other decorations on the brick wall. Now, please take a look at these. Spacious rooms are often intimidating. 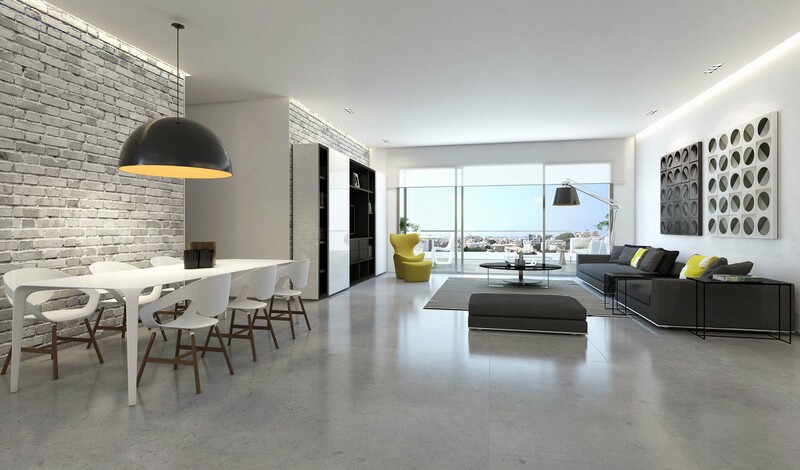 But that’s not the case with this open concept living and dining room, thanks to the white brick walls at the sides. They tone down the superiority and make you feel homey. At the dining area, a set of dining table is placed very close to the brick wall to follow the concept continuity. A large dangling pendant shines above the dining table only to emphasize the already seen modern. Meanwhile, at the living area, the brick wall is made into an accent wall to support the TV stand. We like how the pops of yellow makes its presence among the black and white. To present a white brick wall in your house, you don’t have to install the actual bricks. Many people often consider having brick patterned wallpaper instead. It doesn’t mean to fool anyone. But looking from another perspective, it means there is more than just a way to get the look of a white brick wall. Such wallpaper application is being visualized here. Its intention is to give a little bit color and pattern in the middle of all white stairwell area. The wallpaper application from the bottom of the wall all the way to the upper storey really makes a statement. There is also an option of whitewashed brick wall. You could get the look of whitewash by mixing white paint and water in 1:1 proportion before applying it to the bricks. Or, you could look for whitewashing tutorial on the internet. A set of dining table in white and brown combination is placed in the middle. They want to join the festive of neutral tone in this dining room. 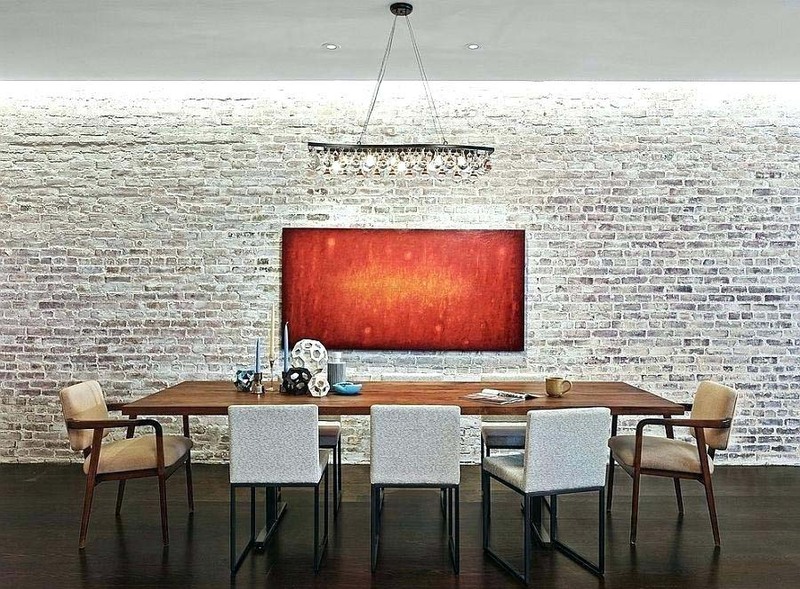 But too much of neutral tones could make boring statement, so an abstract painting in red is mounted on the brick wall. 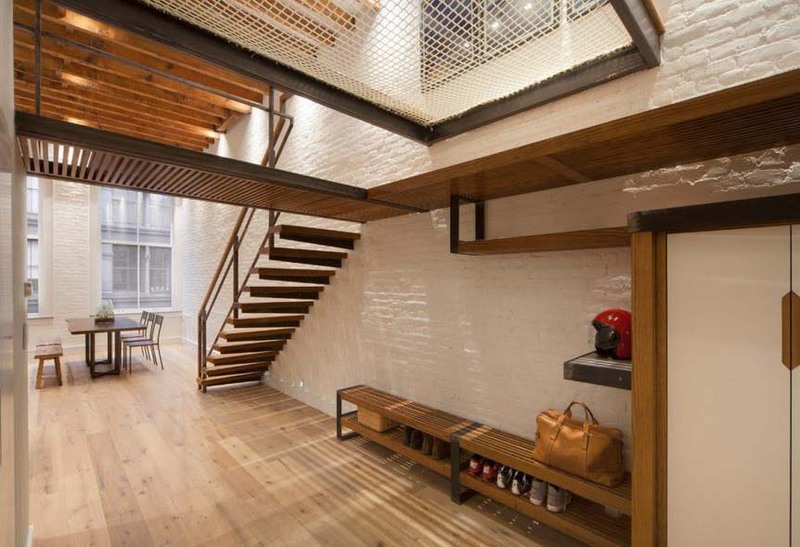 Industrial style is expected whenever the topic of exposed brick emerges. 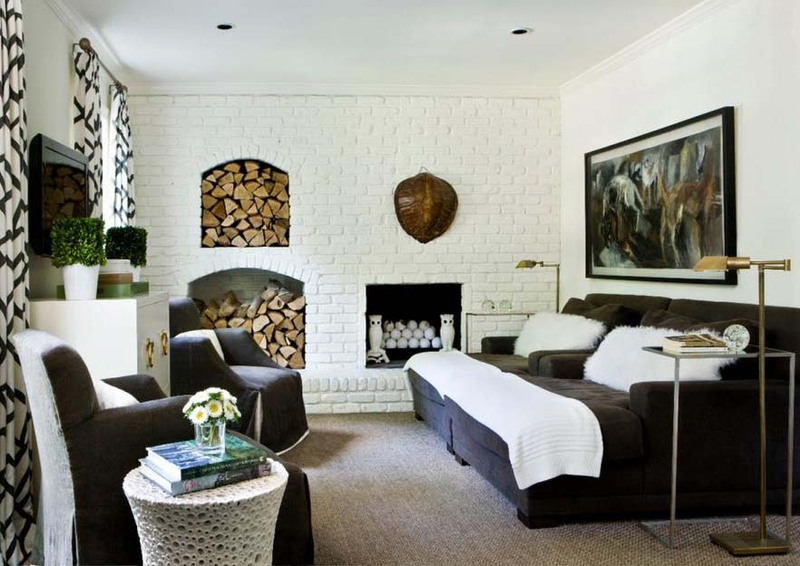 By painting the brick wall white, you just upgrade the look of an industrial styled bedroom. It results in a modern style all over, but not quite. The wooden flooring is on the role to contrast and give balance, while the grey bed sheet is thrown to add calmness. 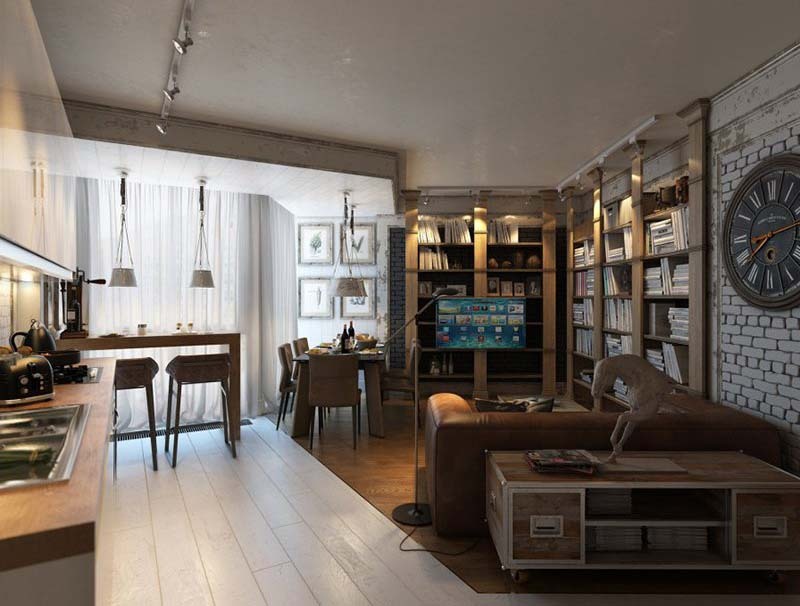 Who would have guessed that a loft could be this inviting? 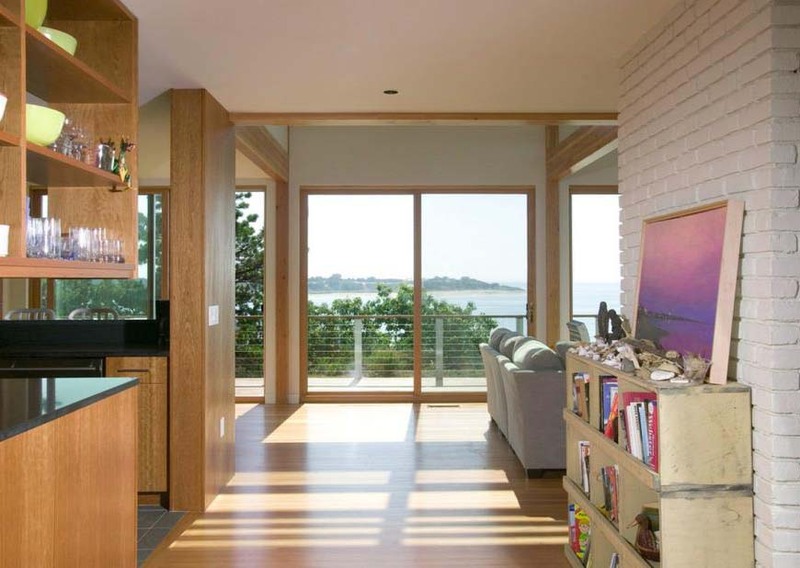 With the help from brick, wood, and metal materials, any space would charm you in any means it could. The interesting part is the brick wall painted in white roots for the wood and metal to be more stand out. As much as white wall gives out purity to the rest of the room, paleness also follows in similar amount. Hence, to avoid being carried away by the negative effect, you should set a vibrant artwork against the wall. That much would lift the mood again and reduce the unwanted feel. We couldn’t agree more about how comfortable this living room is. With the placement of bed-like couches instead of the usual ones, it allows you to lie down near the fireplace while reading your favorite book or watching the television. A clever inset of firewood storage on the white brick wall raises the point of spread throughout the room. The highlight of this modern kitchen is the rich ceiling-height cabinetry against the white wall. It comes as a set with a kitchen island and refrigerator. The options of open and close shelving are also unique. Plus the brick wall existence add some texture into the sleek surface all over the kitchen. You see, the matter with a compact apartment is it’s not spacious. In some cases, even, you have to cramp everything in one place. This image gives a visual explanation. But let’s look at the bright side. Cramped area means you get everything within your reach. It also eases your access from one area to the other. Though it’s not spacious, that white brick wall leaves some nice behind and completely support the theme of masculinity. A tip you could apply to your own living place is marked such area from a certain spot by installing different flooring. Metal, brick, fabrics, concrete; there are four, at the very least, materials involved to create a minimalist yet cozy living room. 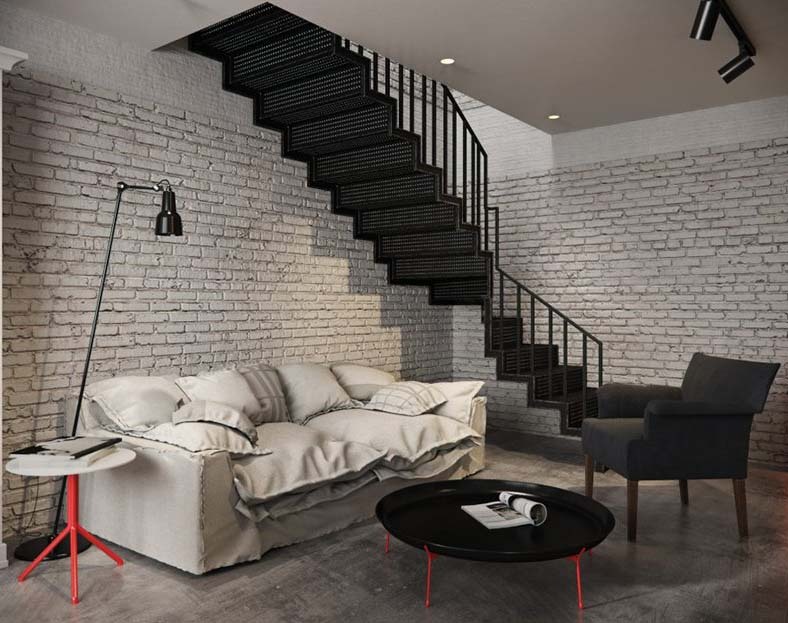 Colored in black and white with pops of reds, this industrial living space is beautiful in its own way. The pros and cons are discussed. The examples are shown. Now, it’s time to mention how the brick wall should be taken care of. Apply an acrylic-based paint or a sealant to the brick interior. It comes in handy to prevent what caused by humidity. Use vacuum’s brush attachment or some microfiber cloth in dusting the interior. Scrub the wall with paste that consisted of water, salt, and dishwashing soap. White brick wall could be really tempting to have since it suits to accentuate any room in the house. However, before deciding anything, remember the pros and cons mentioned above. You wouldn’t want to regret anything, would you? Have a great day!